I’ve suggested a few tools as they each have different strengths and weaknesses. If you don’t have any of your own text to hand, try a paragraph or two of text from a news website. Stanford Natural Language Processing Group tool, ‘An integrated suite of natural language processing tools for English in Java, including tokenization, part-of-speech tagging, named entity recognition, parsing, and coreference’. Instructions for creating simple graphs with Excel’s Pivot Tables and Tate’s artist data. Chart and image gallery: 30+ free tools for data visualization and analysis provides a useful overview chart that can be sorted by skill level, platform, etc, with related reviews and screenshots. See also A Periodic Table of Visualization Methods, Brian Suda’s Top 20 data visualisation tools, or idea.org’s Great tools for data visualization. Network visualisations: Les Misérables character interaction presented as a force directed graph. Visualising media: One million manga pages, Lev Manovich and “How to Compare One Million Images?” In David Berry, ed., Understanding Digital Humanities (Palgrave, 2012). 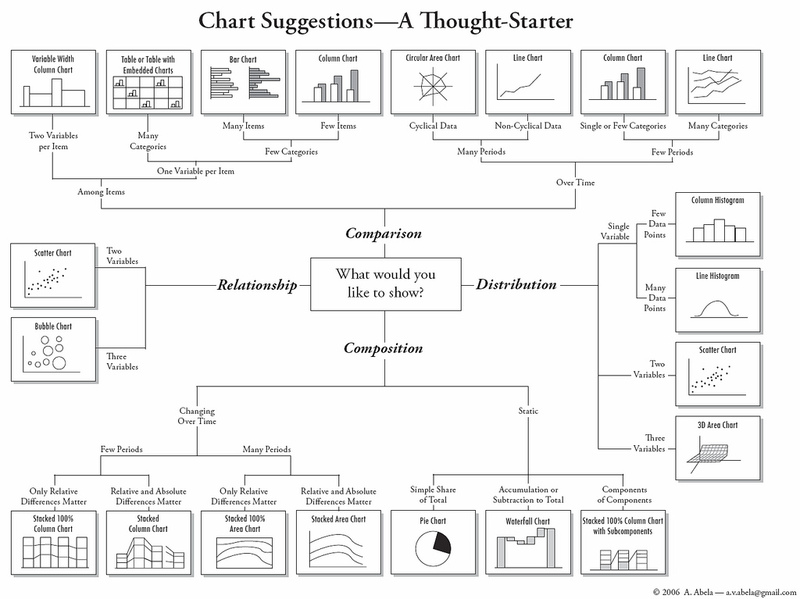 How to Design an Excellent Chart is focused on charts for telling stories (rather than exploring to find new ones) and includes Andrew Abela’s ‘chart chooser’ diagram for showing distribution, composition, relationship or comparison data. See also Juice Lab’s interactive Chart Chooser. See also the projects listed in specific workshop activities. On ‘big data’ as the next big trend: video from Strata 2013: Kate Crawford, “Algorithmic Illusions: Hidden Biases of Big Data” , or written interview with Crawford at Untangling algorithmic illusions from reality in big data. Few, Stephen. 2013. ‘Data Visualization for Human Perception’. Ed. Mads Soegaard and Rikke Friis Dam. The Encyclopedia of Human-Computer Interaction, 2nd Ed. Aarhus, Denmark: The Interaction Design Foundation. Brody, Howard, Michael Russell Rip, Peter Vinten-Johansen, Nigel Paneth, and Stephen Rachman. 2000. Map-making and myth-making in Broad Street: the London cholera epidemic, 1854. The Lancet 356, no. 9223: 64-68. Few, Stephen. 2009. Now I See It: Simple Visualization Techniques for Quantitative Analysis. Analytics Press. Lima, Manuel. 2011. Visual complexity: mapping patterns of information. New York: Princeton Architectural Press. Moretti, Franco. 2005. Graphs, maps, trees: abstract models for a literary history. London: Verso. Tufte, Edward R. 1983. The Visual Display of Quantitative Information. Graphics Press. Tufte, Edward R. 2007. Beautiful evidence. Cheshire, Conn: Graphics press. Ware, Colin. 2008. Visual Thinking for Design. Morgan Kaufmann. Yau, Nathan. 2011. Visualize this: the FlowingData guide to design, visualization, and statistics. Indianapolis, Ind: Wiley Pub. Image: Woodcut of the statue described by the prophet Daniel, from Lorenz Faust’s Anatomia statuae Danielis (“An anatomy of Daniel’s statue”), 1585. In Alan Jacobs, History as wall art.